Tyre Valve For The Aprilia RS 125 Tuono Tyre Valve. 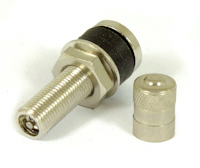 This Is a Replacement Tyre Valve To Fit The Aprilia RS 125 Tuono Wheels. Fits Both Front And Rear Wheels Of The Aprilia Tuono RS125 And All Years. Price Is For Both Front And Rear Tyre.